Gillian Howell is a rare thing - a female whisky-maker. In an industry stereotyped by ruddy-faced old men in hearty jumpers, the petite 28-year-old head distiller is a little out of the ordinary. But not as much as the business she works for - the Welsh Whisky Company - the first and only whisky-maker in Wales for more than 100 years. Based at the Penderyn Distillery in the tiny village of the same name in the Brecon Beacons National Park, since 2000 it has been the smallest distillery in the British Isles. 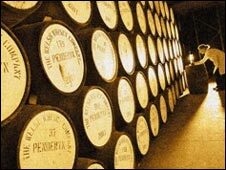 Making just two barrels of Penderyn single malt whisky per day, it has a long way to go to beat the sales figures of the Scottish and Irish giants. But as Ms Howell explains, patience is more of a necessity than a virtue when you are producing whisky. "You certainly can't hurry things along," she says. "You have to wait for the years to pass." With Penderyn currently spending at least four years in old Bourbon barrels before being finished for a few months in Madeira casks ahead of bottling, you'd imagine that a fair amount of daydreaming goes on. Thankfully for Ms Howell, she has to regularly check how each barrel is developing. "It certainly isn't a bad job," the trained chemist admits with a smile. Independently owned by 30 shareholders, including the 23 members of staff, Penderyn was the brainchild of two Welshmen on a night out in their local. "Like most good ideas, it was thought up in a pub," says Stephen Davies, managing director of the company. "The two founders were bemoaning the fact they couldn't enjoy a Welsh whisky after their pints, so they decided they'd have to have a go at making one themselves." Building the distillery in Penderyn to take advantage of a natural spring for their water supply, the first barrels were distilled in 2000 from an initial investment of just £300,000. "And then they just had to wait," says Gillian, who joined the company in 2004. "I'm told they knew they had a good whisky on the way, but there was still that fear of the unknown." When the first 4,000 bottles were finally put on sale on 1 March 2004 - St David's Day - they sold out in less than four hours. But as Mr Davies freely admits, a lot of the first orders were from patriotic Welshmen. "We always knew we'd face an initial uphill challenge to be taken seriously," he says. "But from the word go, we wanted to produce a whisky that could be compared with the best from Scotland or Ireland. "We didn't want to just produce a product that people bought because simply because it was Welsh. We didn't want to be a tourist purchase." 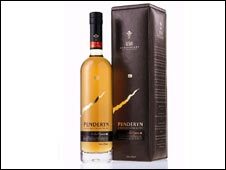 Thankfully for Penderyn, which is made in a light, fruity style that belies its 46% alcohol, a quick look through the industry of books and magazines on whisky shows that it has been very well received. Whisky Magazine called it "stylish", while Jim Murray's Whisky Bible has said it "deserves the highest praise". Now producing 84,000 bottles per year, Mr Davies says they still sell all they can make across 16 countries worldwide, with Penderyn even selling well in Scotland. Although with an investment now totalling £3m, Mr Davies admits the company won't turn a profit until at least 2010. "That's whisky for you, again it is all about the waiting. We are now working hard to build up our stocks." But why does Penderyn spell whisky in the Scottish and Canadian way, rather than the Irish and American 'whiskey' with an 'e'? "That's how Welsh whisky was spelt back in the 19th Century," says Mr Davies. "Although an outraged Canadian did once send us an angry e-mail complaining about the spelling." With hundreds of barrels stacked up in its dark and damp warehouse, the perfumed aroma of wood and maturing whisky at Penderyn is heavenly. "Maturing whisky likes bad weather," says Ms Howell. "Thankfully, it can be very wet and depressing in Wales, so we have perfect conditions."